Capital Title Insurance Agency is one of the oldest, largest and most respected title agencies in Michigan, and is the outgrowth of the renowned Detroit Title Agency, which was founded in 1975. In the 1990’s, new ownership added employees and sophisticated systems, producing further value to serve the growing demands of our clients. 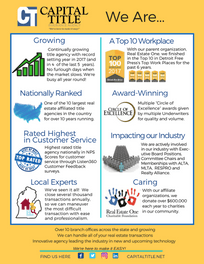 Capital Title has grown from a small independent agency to one of the largest agencies in Michigan, with 18 locations serving all 83 counties. We specialize in handling title and escrow services for residential real estate transactions in Oakland, Wayne, Macomb, Washtenaw, Livingston, Jackson, Ingham, Genesee counties and communities surrounding Traverse City, Beulah and Frankfort in northern Michigan. At Capital Title, the client is always our first priority. Our goal is to make the closing process a smooth one and as easy as possible for all parties involved. Our experienced staff has handled thousands of closings throughout the state of Michigan. If you are buying, selling or refinancing a residential home, investment property or vacant land our staff will ensure the closing process is handled properly and in a professional manner. We’re here to make it easy! Are you interested in working with a leader in the industry? We are always looking to meet with talented people. You may submit a resume and cover letter to Info@CapitalTitle.net. If your experience does not meet our current needs, we may forward your information to one of our affiliated companies. 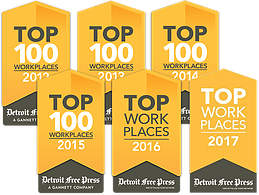 Capital Title Insurance Agency is one of the oldest, most respected title companies in Michigan, and is the outgrowth of the renowned Detroit Title Agency, which was founded in 1975. In the 1990s, new ownership added employees and sophisticated systems, producing further values to serve the growing demands of our clients. 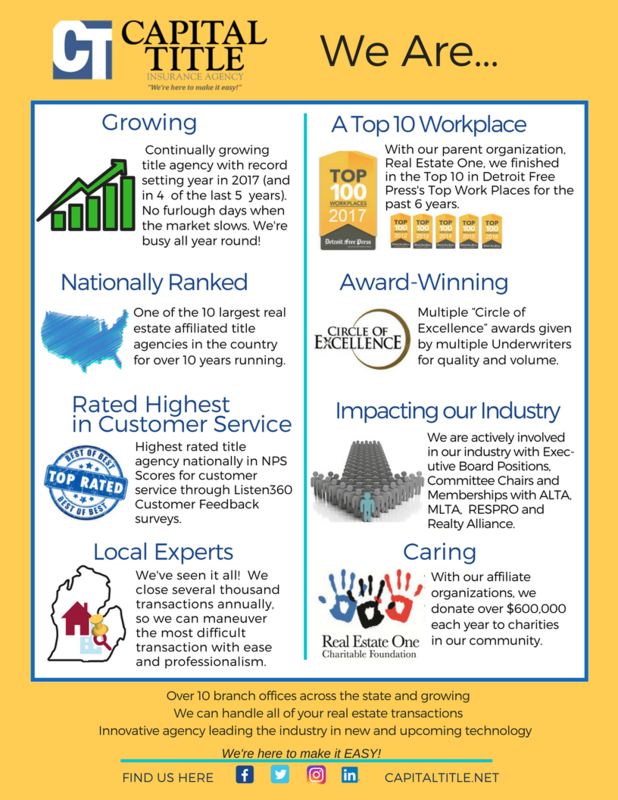 Capital Title has grown from a small independent agency to one of the largest agencies in Michigan, with 12 branch locations covering all 83 counties. We specialize in handling title and escrow services for residential, new construction and commercial real estate transactions. It is our mission to be the number one ranked title company in quality and service. Capital Title is a proud supporter of the Real Estate One Charitable Foundation charities: Special Olympics, National Multiple Sclerosis Society, Alzheimer’s Association, and The Leukemia and Lymphoma Society. Staff members volunteer at Special Olympics events throughout the year and participate in the annual Polar Plunge fundraiser, MS Muckfest, and Alzheimer Walk. The annual Foundation pledge drive has resulted in 100% staff participation for the past few years. Capital Title also adopts families each holiday season through the Volunteers Of America Adopt-a-Family program. An annual bake sale and other fundraisers enable us to provide gifts for one or more families in need each year. Every winter several Capital Title staff members assist at a local homeless shelter by cooking and serving supper and making lunch bags for the visitors to take with them in the morning. Capital Title’s Success StoryCustomer Success Story: Providing new options and better savings for Capital Title. Stewart Title Guaranty Company Agency Services, © 2009 Stewart.